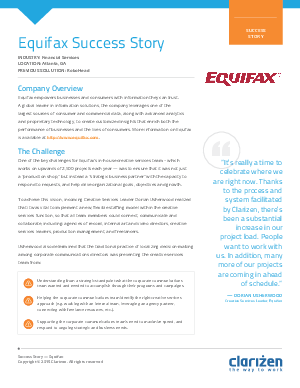 One of the key challenges for Equifax's Creative Services Leader Dorian Usherwood – whose team works on upwards of 2,500 projects each year — was to ensure that the company was not just a “production shop,” but instead a “strategic business partner” with the capacity to respond to requests, and help drive organizational goals, objectives and growth. With Clarizen, Dorian Usherwood was able to implement a new, flexible staffing model within the creative services function, so that all team members could connect, communicate and collaborate, including: agencies of record, internal art and video directors, creative services leaders, production management, and freelancers. Increase in project load because of newfound accountability, transparency and visibility. Increase in projects completed ahead of time. Increase in overall team productivity across the creative services team. Ability to track project lifecycle.